Fresh rosemary and ginger infused simple syrup with pear nectar and ginger ale. Easy Sparkling Ginger Pear Mocktail, or add alcohol for a holiday cocktail. Within this post you’ll make simple holiday mocktail with an infused simple syrup base. Plus you’ll learn tips for infusing simple syrups and alcohol. With Christmas and the holidays just a few days away and the New Years just around the corner, we all should take a bit of time to celebrate and appreciate the highlights of the year. 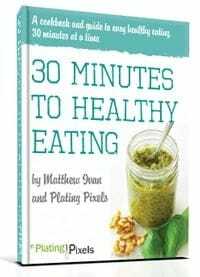 I’m grateful for my health, family, friends, my partner Olia, and the success of this blog. It’s been an intense, but fun climb towards success. I’m not going to share income, but I will say this month has been my best month by far. There’s always room to grow and improve, and I feel I’m just getting started. I’m absolutely ecstatic about the opportunities next year will bring. To celebrate, drinks and cocktails are always a fun way to say thanks to yourself. This Sparkling Ginger Pear Mocktail recipe is a refreshing and vibrant drink for anytime, even for celebrating with kids and family. Of course, if it’s just for adults, I highly recommend adding your favorite alcohol, such as vodka, rum or sparkling white wine. 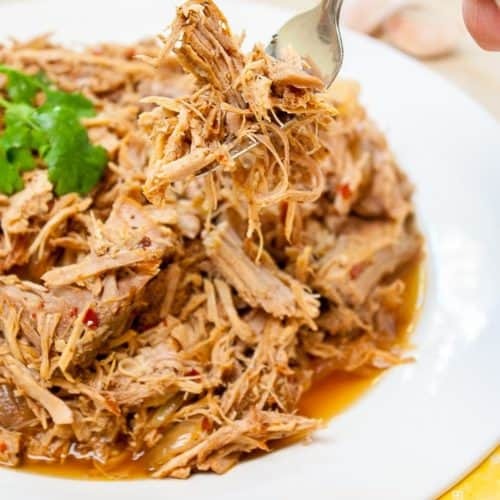 This recipe is flavorful on its own or an ideal base for a celebratory cocktail. Start by making a quick and easy rosemary ginger simple syrup. Just heat sugar in water, with fresh grated ginger and rosemary sprigs. 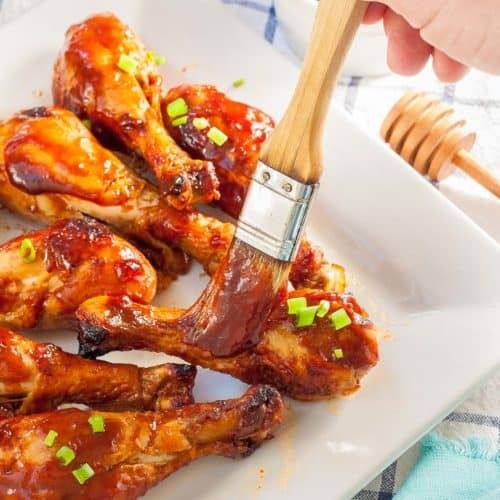 After about 10 minutes it thickens up and is infused with the bold bite of ginger and rosemary. Once you have your rosemary ginger syrup, you can store it in the fridge for easy individual drinks. Just add about a tablespoon to a glass, and top with pear nectar and ginger ale over ice. 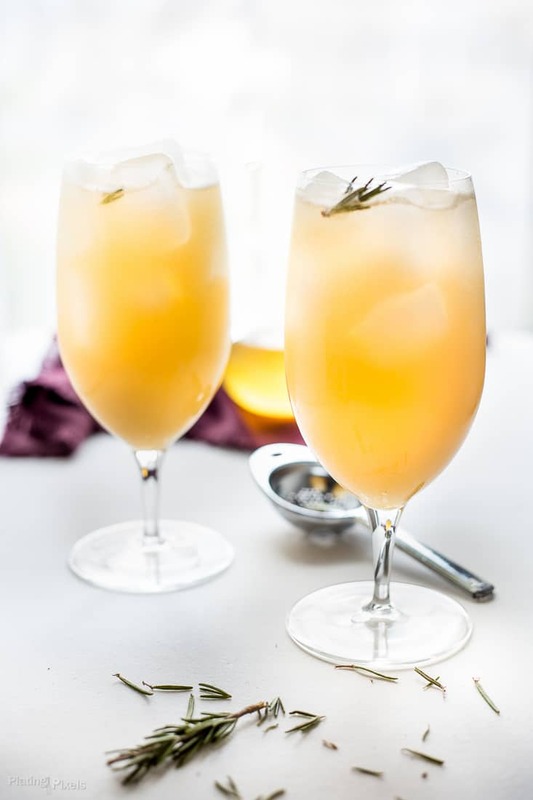 This Sparkling Ginger Pear Mocktail or cocktail is a wonderful holiday treat. Fresh ginger and rosemary infused simple syrup mixed with pear nectar and ginger ale, enjoyed in an elegant glass. I wish you happy holidays and look forward to many success in the new year. You can infuse alcohol (or liquids) with almost any flavors like fresh or dried fruits, berries, vegetables, spices, flowers, roots and herbs. Simple syrup is a mixture of sugar and water, usually equal parts, with the optional addition of flavors. 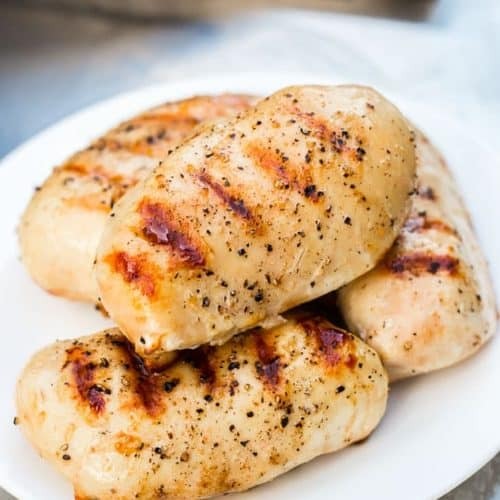 For this recipe I cooked it down with fresh rosemary and ginger. Boiling extracts oils and add strong flavor to the syrup. Just about 10 minutes is all you need to create a simple syrup. If you are infusing alcohol, it’s best not to cook or heat it. So the infusing will take much longer, at least a couple days but much longer for stronger flavor. 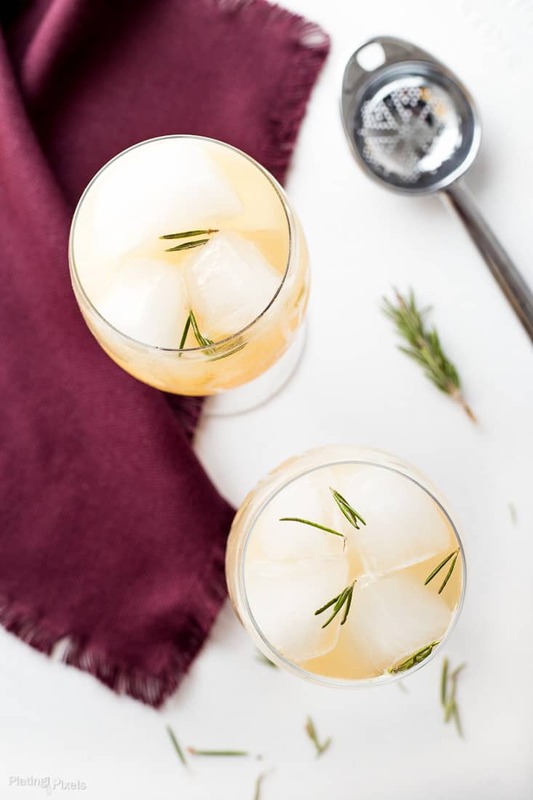 Flavor profiles: Crisp ginger and ginger ale add bite to speed pear and rosemary infused mocktail. Texture: Cool and sparkling drink with smooth finish. Dietary Options/Substitutions: This recipe is vegan and gluten-free. Could substitute diet ginger ale if preferred. 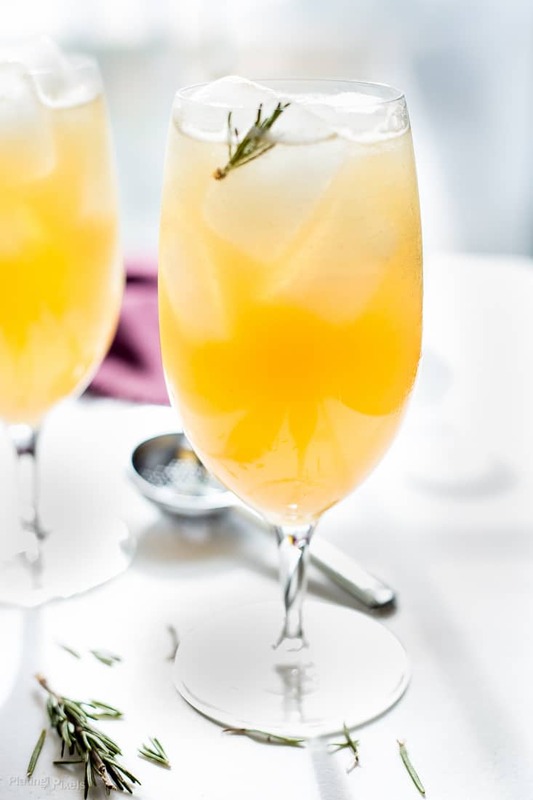 Refreshing sparkling pear mocktail or cocktail with crisp bite of ginger and rosemary. Place sugar, water, ginger and rosemary in a small pan over medium-high. Stir and bring to a boil, reduce heat to medium-low. Simmer uncovered for 10 minutes, stirring occasionally to thicken and infuse flavors. Remove from heat and cool completely. Strain into a jar or container. To make drinks: Fill glasses with ice. 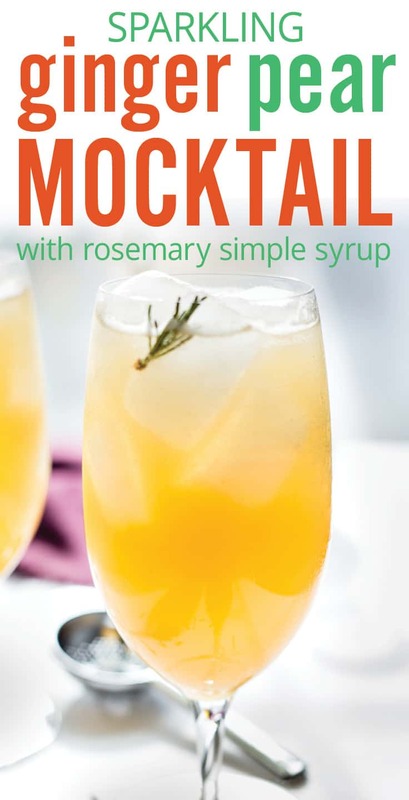 To each add a tablespoon of the ginger rosemary simple syrup, 1/3 cup ginger ale and 1/3 cup pear nectar. Stir and enjoy immediately. Extra simple syrup can be stored sealed in the fridge. Mmmm this sounds so refreshing and delicious, thanks for the recipe! Thanks and you’re welcome Bree! It’s a lovely combo and knowing you Leah I’m sure you’ll come up with something awesome! That’s so sweet of you to say Mackenzie! You can’t see but I’m blushing. Have a wonderful holiday too! That’s so funny! I just made my first syrup this morning! It was an almond chocolate one and I have yet to try it. If it goes well I will add this to my to-make list too. It looks like a lovely party drink. I would love it if you came to link up at our party. That sounds yummy too! Thanks Hil and I’ll check out the link party. Mmm that sounds wonderful too. Thanks Lindsay!